Frank George Blazek, 88, of Schuyler, died Monday, February 11, 2019,at his home. 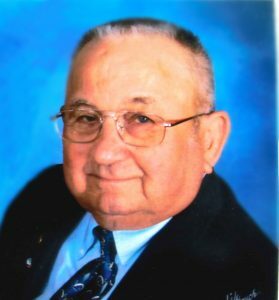 Funeral Service Monday, February 18, 2019, 11:00 a.m.
Frank Blazek was born February 22, 1930, in rural Dodge County to Frank Joseph and Libbie Emily (Ruzicka) Blazek. He received his education in rural district #22, Colfax County and graduated from Howells High School in 1947. Frank was a Korean War Veteran. He enlisted in the United States Navy on November 12, 1951, and served as a Machinist Mate 2nd Class on the Aircraft Carrier USS Boxer CVa21. He was a lifetime farmer. On August 16, 1975, he married Marilyn Horak Hlavac at the First Presbyterian Church in Schuyler. Frank always liked caring for farm animals and feeling the good earth in his hands. He had served as an Ordained Elder of Bethlehem Presbyterian Church, rural Howells, and was currently a member of First Presbyterian Church in Schuyler. He was also a lifetime member of VFW Post 4836 in Schuyler and had served 17 years as Adjutant and was a member of the Honor Guard for many years. Frank was a member of the Colfax County Service Committee, was on the Election Board for 30 years and in his lifetime, donated 18 gallons of blood to the Red Cross. He is survived by his wife, Marilyn, of Schuyler, daughter Teri Lynn (Rod) Dostal of Dodge, son, Marc Dean Hlavac, Garrison, grandchildren; Eric "EJ" (Beth) Hlavac , Riley Hlavac, all of Garrison, Susan (Randy) Muhsman, Schuyler and Charles (Jacki) Dostal of Dodge, great-grandchildren, Hunter, Emma, Jacob and Maximus Hlavac of Garrison and Ryan and Kendra Muhsman of Schuyler, brother-in-law Robert (Joyce) Horak of Walker, Minnesota, nieces and nephews. He was preceded in death by his parents and in-laws, Jerry and Lottie Horak.